The Hackathon challenged participants to use the data and technology available to them to come up with tangible solutions for the road user. Darawees Taliep from ETC (left) congratulates the members of Team “On the Road Again” for their winning mobile solution. The South African National Roads Agency (SOC) Limited (SANRAL) understands the importance of and is fully committed to developing South Africa’s knowledge economy, using the pillars of knowledge sharing, skills transfer, collaboration and innovation. 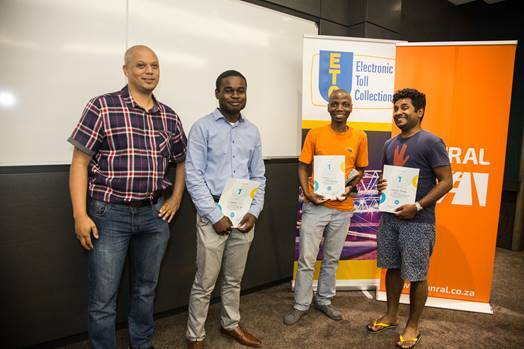 SANRAL and Electronic Toll Collection (ETC) recently partnered with WhereIsMyTransport to host the ETC Hackathon in Cape Town. With the theme of Collaborate & Innovate, participants in the Hackathon were invited to create innovative smart mobility applications utilising both Gauteng Freeway Improvement Project (GFIP) toll gantry data and WhereIsMyTransport public transport related data. SANRAL, manages the tenth-largest national road network in the world and has, for some time, been operating in the digital space with its Freeway Management System that deploys dedicated cameras on 520km of the busiest freeways across the country. Here, real-time traffic data is collected and used to determine how best to respond to an incident, dispatching the relevant response entity and ultimately saving lives on our roads. Randall Cable, SANRAL’s Western Region Manager, officially opened the Hackathon challenging the participants to use the data and technology available to them to come up with tangible solutions for the road user. “It is encouraging to see the low average age of the participants (under 25 years) and how committed these young South Africans are to be part of the change they want to see in our country,” said Cable. The Hackathon was sponsored by ETC, which was established in 2009 to supply and manage an integrated tolling system on behalf of SANRAL. According to Darewees Taliep from ETC, the system handles 550 000 transactions per hour, which equates to 155 transactions every second. ETC made a random selection of transactional data available to the participants for them to create a mobile solution to aid safe and improved road user experiences. Some of the proposed avenues included drawing usage/behaviour patterns, analysing traffic volumes, customer service centres and identifying foreign vehicles. “It is believed that 90% of the world’s big data was gathered in the last two years only. Big data analytics and building solutions using this data is definitely where the world is headed,” said Talliep in his briefing session to the participants. In Cape Town, 50% of all public transport trips occur in minibus taxis and involve primarily women and children under the age of 13. They do so without a schedule or the ability to plan according to a timetable, yet they must get to work and to school on time. This is according to WhereIsMyTransport, who facilitated and provided expert tech and data support during the weekend. Through their public transport API, they gave participants access to all the main public transport platforms, ie. bus, taxi, train, walking routes, etc, and these could be integrated to best achieve usable public transport solutions for the public. The winning team, which conceptualised a mobile solution that delivers turn-by-turn public transport directions via SMS or WhatsApp, walked off with a R20 000 cash prize and a year’s worth of free access to the WhereIsMyTransport Public Transport API. Cable said: “SANRAL firmly believes in the ability of the youth to add value to the broader transport industry. We have invested in a Technical Innovation Hub, which is thriving with young engineers exploring the extent to which technology can improve road user experiences, particularly as we head in the direction of smart cities, which demands smart mobility and disruptive thinking.